To the non-gamers among you, Valve software is the gaming’s industry most original player. They combine game design innovation, with marketing and business model innovation, they are the avant-garde. you could say they are the Pixar of game development, only they’re much more. “Coming up with a Meet the Team short [* animation shorts promoting one of their games. 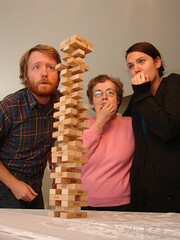 UB] is a lot like a game of Jenga. 99% of it involves making room for an idea and seeing what happens. This entry was posted in Branding, Marketing and tagged creativity, ideas, valve, valvesoftware by Uri Baruchin. Bookmark the permalink.